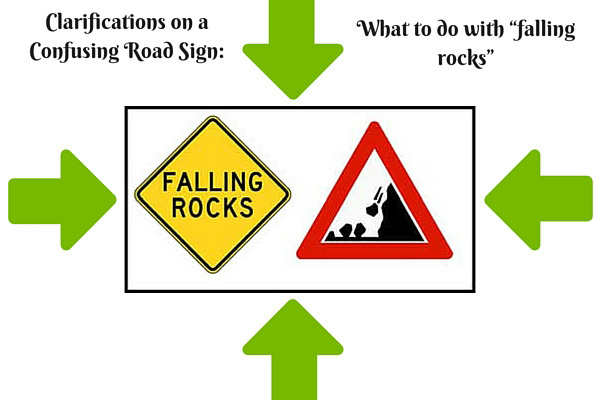 Clarifications on a Confusing Road Sign: What to do with "falling rocks"
What should motorists and drivers do when they encounter the the road sign warning them of falling rocks? Should they drive faster to dodge them or be more careful and drive slower? As funny as it may sound, this road sign’s warning is something we should take seriously. There are groups that consider many of the government’s road signs to be useless and just a waste of taxpayer’s money. For instance, they argue that instead of using taxpayer’s money on road signs that warn drivers of falling rocks, they should fix the problem and use their budget in preventing rocks from falling. There are already many ways to fortify the hills or mountains in the road side to prevent rock slides. For example, the simple task of planting more trees will not only be good for the environment, it will also prevent these “falling rocks” from putting the lives of our motorists at risk. But since there’s really not much we can do about this, it is better to just take the precautions and know what we can do to avoid accidents in these “falling rocks” areas. If there are alternate routes then it is better to just take those even if it might take longer for you to reach your destination. It is better to be late than not arrive at all because of an accident. Also, these roads should be avoided especially if it is raining. Rainfall really increases the risk of landslides. Be vigilant and more aware in these places, many times an accident can be avoided with proper awareness and good reaction time.